Stephen O'Donnell (left) and Coleraine manager Rodney McAree. Pic by Pacemaker. Curtis Allen. Pic by Pacemaker. And the Showgrounds skipper considers the changes made since McAree arrived at the club are now bearing fruit. 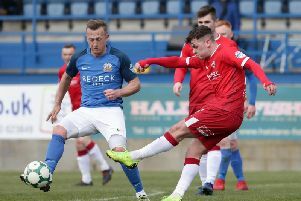 The Bannsiders opened up a six-point gap on Glentoran following their win at Windsor, but O’Donnell knows the Glens will be up for the battle on Saturday. “They aren’t playing like the bottom-six side they were last season and they are looking to finish in the top half. “Again, we should have won the cup game a few weeks ago but we didn’t. “Oran Kearney and Coleraine revived my career, because I was down in the dumps a bit,” said the frontman, who has racked up 100 goals at The Oval. “To go there and score 45 goals over two seasons and get a move to Inverness, I achieved my goal of trying to get back to full-time football.